Automatic Press in High Gear! XP would like to welcome another new arrival to the business... Julia Edith Allen! Julia was welcomed to the world on August 8th at 10:42am coming in at 6 lbs 8 oz. and 20 inches long. Mom, baby, and proud Dad are all doing well! Our New Machine Has Arrived!!! XP is proud to announce the latest addition to our expanding business, our new automatic screen printing press! Our new Workhorse Javelin Pro will enable us to better serve our customers and to expand our existing contract business. The quality of the print is unrivaled, contact us today and we'd love to show you what our new machine can do. Big thanks to our friends at Workhorse for getting us up and running so quick! Xpression Prints is proud to announce the addition of e-commerce to our website! To celebrate we are offering a one week special of 20% off your purchase. Simply enter the promo code "XP2014" at checkout. Reflecting on Xpression Prints' 2013 I feel compelled to take a moment to thank each and every one of our customers for making it our most successful and transformative year yet! 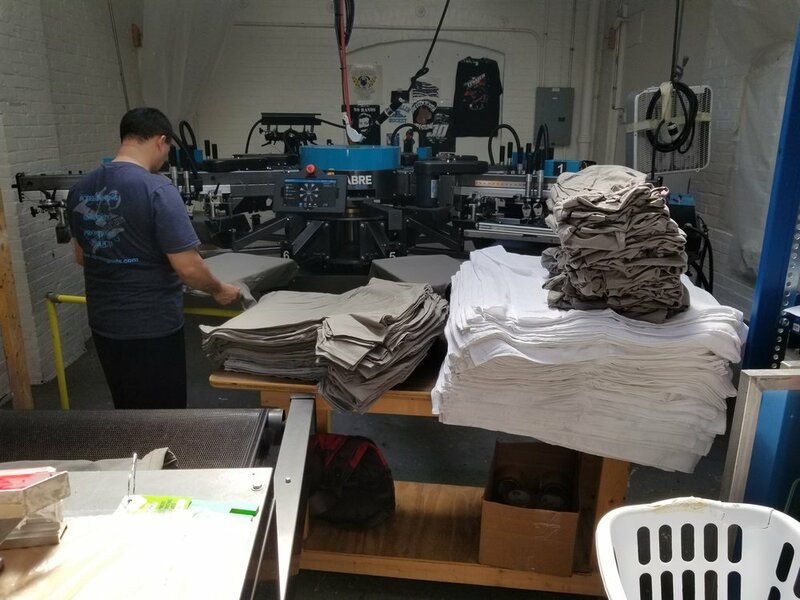 In 2013 we moved our offices and production facility, purchased a new embroidery machine, and expanded our sales and production staff... not a bad year huh? None of this would have been possible without your loyal patronage and for that, I thank you. We are excited about 2014 and look forward to serving you with all of your promotional product needs. Wishing you and your families all the health and happiness this year! Our New Machine Has Arrived!!!! With business being as busy as it has this past year we've decided to expand our embroidery department with another embroidery machine! We are excited to announce the arrival of our happy and healthy new "baby", Barudan. Just a few days into our new shop and construction is well under way. Big thanks to Chris's Carpentry for their custom built tables and benches, great work!!! After many happy and successful years in our original shop we have finally outgrown our space. We are excited and pleased to announce that we have moved our main office and production facility to the historic Mosley Mill building in Franklin, MA. Our new location has provided us with a bright and spacious location with room to grow, we couldn't be happier! We thank all of our new and amazing neighbors in the mill for their warm welcome! Keep your eyes peeled for our Open House announcement on Facebook, hope to see you in our new HQ!